One key part of Apple's capital return strategy is to use its free cash flow -- as well as the significant amount of excess cash that's sitting on its balance sheet -- to repurchase stock. In fact, at the end of the fourth quarter of Apple's fiscal 2018, the company had $71 billion left of the $100 billion share repurchase authorization that its board of directors approved back on May 1, 2018. Apple has likely utilized a material portion of that authorization over the last several months. So, you might be asking yourself this: Can Apple use its share repurchase program to help boost its stock? The answer to that is complicated. Let's take a closer look. 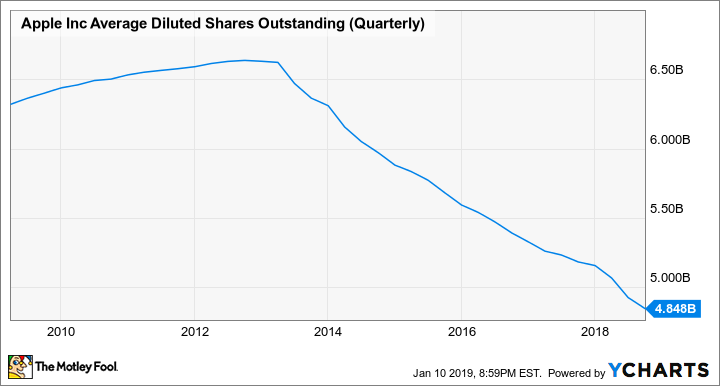 A key benefit of share buyback programs is that they can increase a company's earnings per share (EPS) by reducing the number of shares outstanding. The math here is simple -- divide a company's earnings by a lower share count, and EPS gets bigger for a fixed amount of earnings. Apple Average Diluted Shares Outstanding (Quarterly), data by YCharts. Apple wouldn't be able to report the EPS figures that it can today if the company hadn't bought back all of that stock. And since stocks are often valued based on metrics like price-to-earnings, the lower share count certainly helps improve those metrics and, potentially, the attractiveness of Apple stock. With the difficulties and, frankly, cloud of uncertainty that surround Apple right now -- given the significant shortfall in iPhone sales that Apple reported recently -- a lot of investors might be skittish about investing in the company. After all, while Apple looks "cheap" today (it trades for less than 13 times analysts' fiscal 2019 EPS estimates), if sales continue to deteriorate, then the stock won't look quite so cheap. Put simply, I don't think that Apple stock will appreciate significantly until its core iPhone business shows signs of stabilization at a minimum -- and preferably modest growth. Now, if Apple's iPhone business (and, by extension, Apple's business as a whole) gets back on track and Apple can deliver consistent revenue and net income growth in the future, then any share repurchases that Apple executes while the stock is down will serve to amplify that growth, benefiting shareholders. However, if Apple's business goes into a multiyear funk where revenue and profits continue to slide, then the buybacks -- though accretive to the company's EPS -- won't be sufficient to save the stock.